I can't believe one of my little bears is big enough to go to school this year! Where does the time go? While she's super excited to head off to big kid school, I am trying not to think too much about it. I'm going to miss having one of my sidekicks with me during the week but it's really time for her and she's getting pretty bored of me. One school related thing I have been thinking about is healthy yummy snacks for her to take. I thought now would be a great time to post a healthy snack recipe once a week in the lead up to the start of school. Each recipe can be made in bulk and frozen. 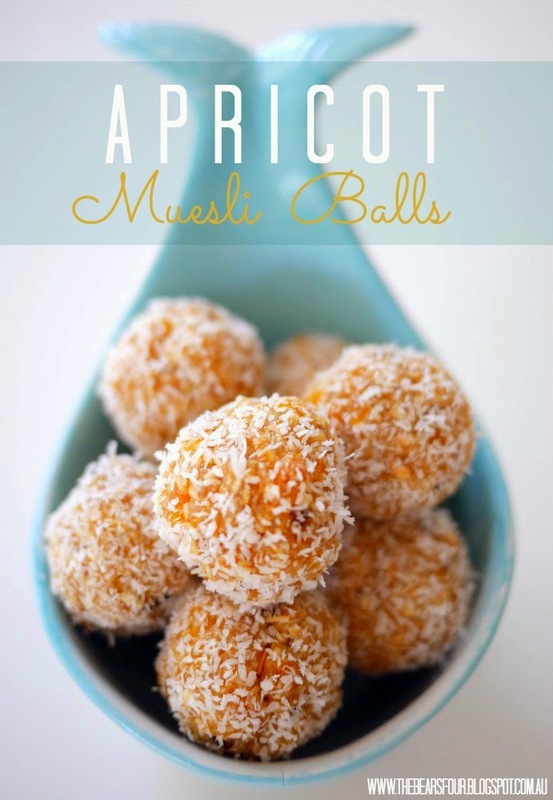 Read on for how to make these delicious apricot muesli balls. Step 1: Place muesli, apricots, honey and melted butter in a food processor. Process for 2 to 3 minutes or until well combined. Step 2: Place the coconut in a shallow dish. Roll tablespoons of muesli mixture into balls. Coat each ball in coconut. Refrigerate until firm then transfer to airtight container and freeze. A quick, yummy and healthy school snack.